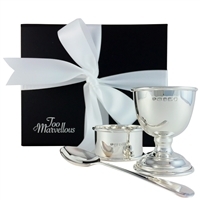 Hallmarked solid sterling 925 silver 3 piece egg cup, spoon and napkin ring gift set. Made in England. Gift boxed. Perfect Christening Gift! Gift set featuring 925 sterling silver stag head bottle stopper, stag antler cork screw and 925 sterling silver bottle drip collar. Gift boxed and ribboned. Hallmarked 925 Sterling Silver and Wood Peugeot Salt and Pepper Mill Set with Peugeot Mechanism. Gift Boxed. Traditional Capstan Shape. 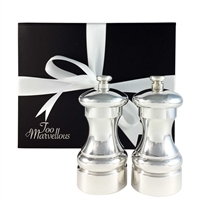 Sterling 925 Silver Peugeot 4 in / 10cm Salt and Pepper Grinder Mills with Peugeot Mechanism. Lifetime Guarantee and gift boxed with pouches. Traditional Capstan Shape. Made and hallmarked in Birmingham.